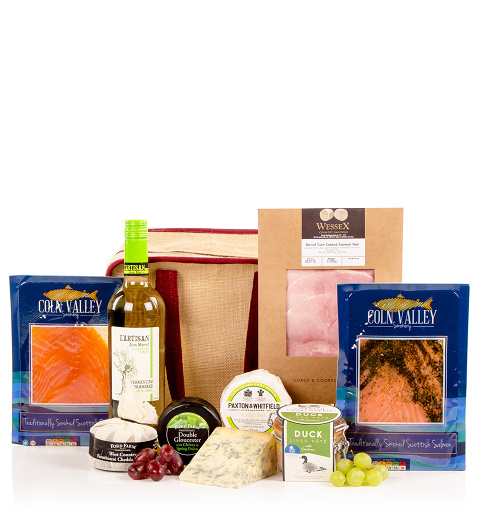 This fresh food hamper is a fine gift choice for those who love the finer things in life. The sliced ham, outstanding Coln Valley salmon and Gravadlax are just part of this fresh food hamper that will provide a welcome feast for the lucky recipient. Coln Valley Smokery Sliced Gravadlax 125g ? Coln Valley Smokery Sliced Smoked Salmon 125g ? Ford Farm Double Gloucester with Chives & Spring Onion Truckle 200g ? Paxton & Whitfield Celtic Soft Cheese 200g ? Wessex Country Gammon Dorset Cured Sliced Ham 200g ?